Acrylic Dice Boat Sale Price: $7.89. Was $12.50. Save 37%!. Wood Dice Boat Sale Price: $7.69. Was $9.50. Save 19%!. Our casino quality dice sticks are made of maple-color wood. Choose from four lengths: 30-inch dice sticks, 36-inch dice sticks, 42-inch dice sticks, and 48-inch dice sticks. 30” Sale Price: $12.00. Was $15.00. Save 20%. 42” Sale Price: $15.60. Was $19.50. Save 20%. 48” Sale Price: $17.20. Was $21.50. Save 20%. This table brush has a pine colored hard wood handle and nylon bristles. 10.5 inches long, our table brush features ergonomic groves for easy gripping / brushing. Sale Price: $6.81. Was $9.95. Save 32%! 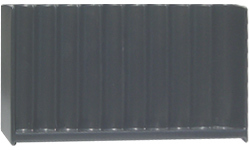 Our "Easel-Style" Upright Chip Racks are made of sturdy black ABS Plastic. Choose from 200-Chip/4-Row Upright Chip Racks and 500-Chip/10-Row Chip Racks. 200 Chip Rack Sale Price: $9.94. Was $22.50. Save 56%! 500 Chip Rack Sale Price: $11.68. Was $34.50. Save 66%! 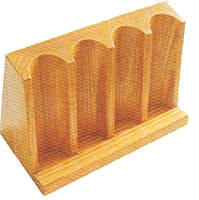 Made of Mahogany-stained hard wood, these Upright Chip Racks are professional quality. 10 Row / 400 Chip Capacity Racks are available for 6 and 8 foot crap tables. 15 Row / 600 Chip Capacity Racks are available for 10 foot crap tables. 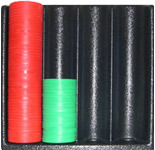 Each 15 Row Craps Chip Rack measures 21.5 inches across and 6 inches tall. Our 140-Chip/4-Row Upright Wood Chip Racks are a great addition for your next crap game. Sale Price: $12.50 Was $25.00. Save 50%!. For more information on any of our Craps Supplies, please feel free to contact us at 1-800-233-0828.